The theme of this article is to discuss the promotion and fulfillment of hospice care in the cross-straits. 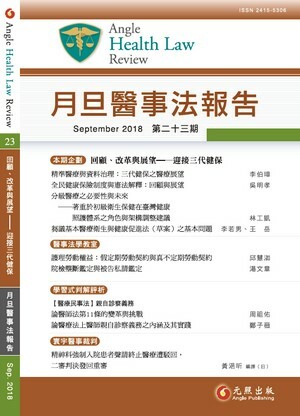 Observing experiences in Taiwan, the development of hospice care is closely related to the legalization process of the “Hospice Palliative Care Act” and the “Patient Right to Autonomy Act” and payment included in the national health insurance. Also, this article observes each symptom control, comfortable care, and mental support and humane care aspect of the “Hospice Care Practice Guide (Test)” in Mainland China, and highlights the importance of “trust”, the necessity of “participation” and the value of “dignity”. In other words, the “Hospice Care Practice Guide (Test)” seeks hospice care to display in all directions of body, mind, and spirit in one human being. By discussing the hospice care topic in this article, experiences can be exchanged and shared in the cross-straits. Both Taiwan and Mainland China can jointly participate in this era, which symbolizes patient autonomy conscious’ awareness in the final stage of life.